There are people who ‘love curry’ and then there are people who actually love Indian cuisine. I’d had two recommendations to try the Royal Virundhu on Queen St in the last few months – which is usually enough for me to try something out for myself and I arrived early enough on a weekday to ensure I didn’t have to compete with the corporate crowd, if there was indeed one to report. It was quiet, and we ordered a selection of vegetarian dishes. It’s my feeling that if you can make vegetables sing, then you can be confident that the meat dishes will be even better. We ordered a mixed starter with Aloo Tikki, Paneer Tikka, Samosa, Onion Bhajee and -impressively- a medhu vadai (the donut shaped item) and the vegetarian lunch time special of dhal served with rice and naan. Sadly for me, the dosa plate was broken, so I couldn’t try that particualar delight which I had been looking forward to. As you can see from the photo, the starter was artfully presented and the bahjee were not so much compressed balls of onion, but a loose, textured and delicious pile of crispy battered onion. Everything on the starter plate was excellent, both in flavour and texture. There was a range of heat-level from mild to quite spicey and the ingredients were fresh and freshly cooked. 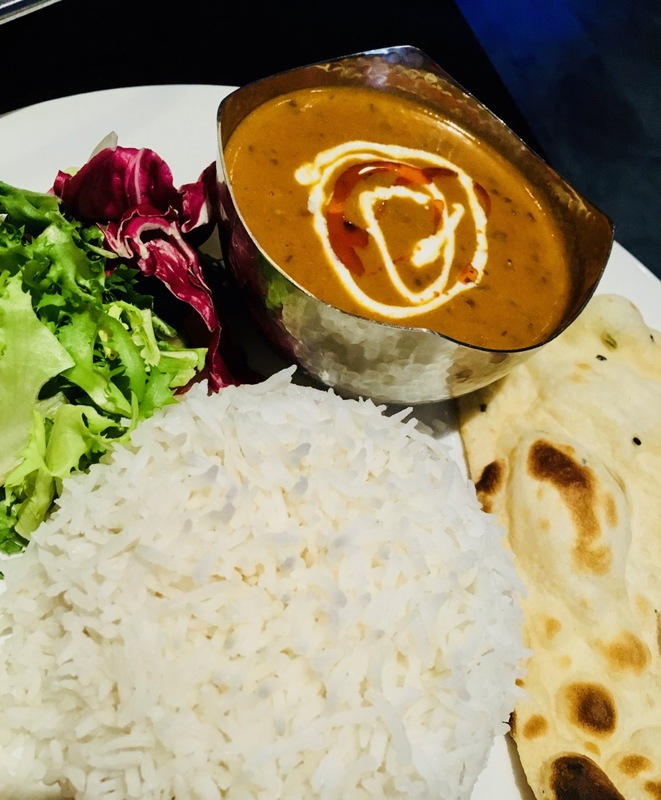 The vegetarian lunch time special comes in under £6 and excellent value for money. The dhal was extremely flavoursome and rich yet light, fresh and saucy enough to make your rice and naan last. 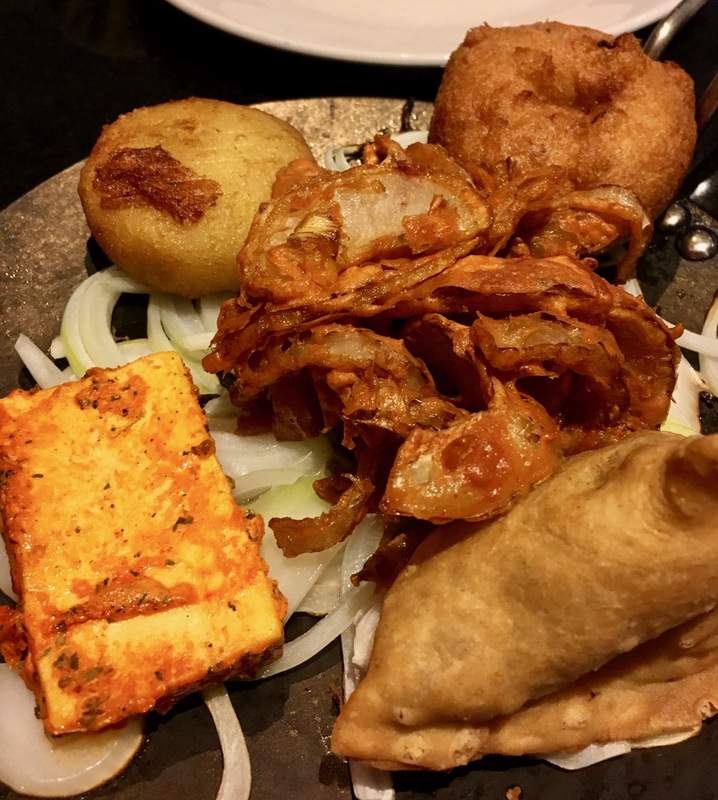 With a selection of chutneys, our meal was not only satisfying, but richly variegated with sweetness, spice, heat and plenty of savoury depth. Virundu is a tamil word for ‘feast’. The family who run Royal Virundu became known in their new-found British community for serving up feasts replete with wonderfully authentic ‘food from home’. While those who ‘love curry’ will find all their favourites on the Royal Virundu menu, people who truly love Indian cuisine in all it’s various colours and flavours, will enjoy the flavours and vegetarian specialities of southern India. The menu at Royal Virundu isn’t shadow cuisine tweaked to please a British palate, it is authentic, fresh and fully-realised Indian cuisine. I will return to the Royal Virindhu to try their dosa and hopefully work my way through their menu, but I’ll be sure to come again when the doors open at midday, because of course by 1 o’clock the restaurant was filled with the Maidenhead corporate crowd enjoying the lunch time special.